We've been having some really nice weather recently, so we decided it was time to dust of the barbecue and initiate grilling season. 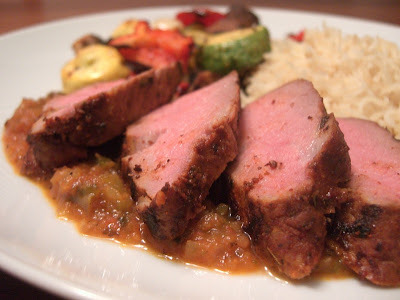 The dish above we dubbed Grilled Pork Tenderloin a la Mexicana. It is inspired by a really nice Puntas a la Mexicana, which was beef tips in a tomato-chile sauce. Here we are using whole slices of pork, but the flavors are very similar. 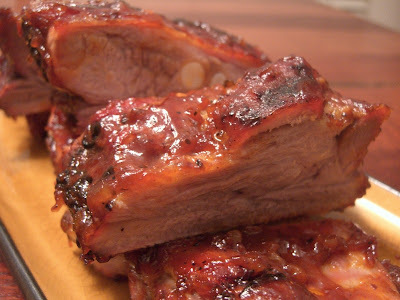 But grilling season hasn't really begun until we've done our first slab of ribs. We served up this batch with some potato salad and some grilled asparagus. 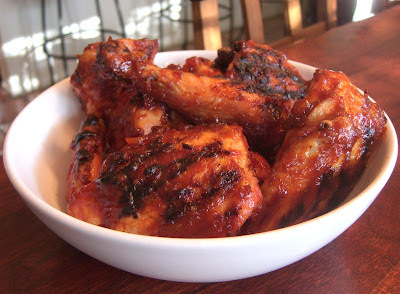 And of course we can't forget barbecued chicken. There is nothing quite like crispy sauce-slathered chicken skin hot off of the grill. 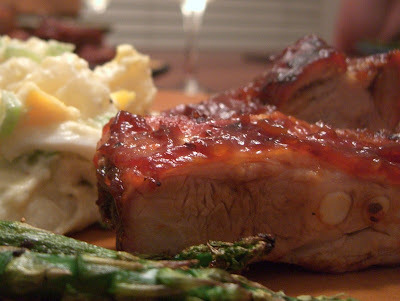 We haven't posted a recipe in a while, so here is our house barbecue sauce. It is the recipe I grew up with and is still my favorite. We sometimes modify it a bit - adding some chile for heat, for example. In a small sauce pan, saute onion in butter to soften. Stir in remaining ingredients and simmer 20 minutes.